HERDSA Review of Higher Education is an annual review of key issues facing higher education in the Australasian region. Each issue consists of a collection of peer-reviewed articles that review scholarship of teaching research, conference proceedings or work previously published in research journals. These reviews are undertaken by commissioned authors who have been recognized for their expertise in the field. In such a review authors describe how the issue is conceptualized within the literature, identify theories and practices that are shaping the outcomes of higher education and discuss the strengths and weaknesses of these outcomes. 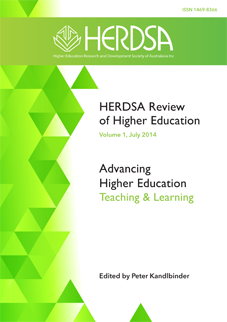 HERDSA Review of Higher Education is distinctive from other review journals in two main ways. Firstly, it focuses on higher education systems within Australasia and thereby draws out implications for research and development that has direct relevance to the HERDSA membership. Secondly, the selection of topics will be objective in the sense that they are based on significant themes that emerge from the HERDSA Conference Proceedings, HERD journal keywords and funded teaching and learning project reports. These themes will be ranked in a bi-annual survey of DVC (Academic) & PVC (Teaching and Learning) to ensure each volume addresses the highest priority issues facing Australasian universities. It is expected that HERDSA Review of Higher Education will benefit HERDSA members by providing timely information and authoritative advice about major issues confronting higher education. It complements the other publications currently offered by HERDSA by bringing together discussion of issues facing higher education into a single collection. Even though a range of common challenges exists across the sector, there appears to be a lack of awareness on how research can support policy development in higher education in any meaningful way. This may partially be due to a steady turnover of senior academic leaders and their focus on practice, which leads many of them to rely solely on internal staff resources for strategies for dealing with the day-to-day issues facing their institution. Online copies of HERDSA Review of Higher Education articles are available from the HERDSA web site at no cost. Readers who prefer paper copies of articles are able to purchase print versions from the HERDSA office.